Whether you are a seasoned investor or never purchased a property before you don’t want to miss the investor weekend. Join us for a powerful, knowledge-packed weekend with over 10 informational sessions that are bound to enlarge your real estate investments. You will hear from the best national and local real estate investors that will share practical and relevant experiences with you. There will be several networking sessions to connect with other like-minded people for potential funding, partnerships, and yes hot deals! Register for the event now! 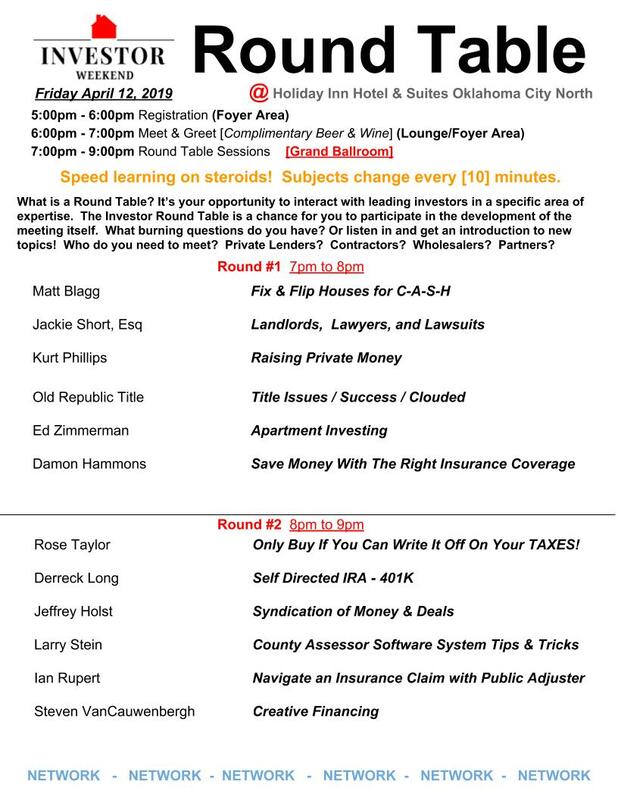 If you're New to Real Estate, Investing, Landlording, Property Management, Wholesaling, Note Buying, Private Lending, Rehabbing or a Real Estate Entrepreneur, there is no better place to be on April 12 through 13 2019 at the Investor Weekend event. If you have any questions call 405-679-2278.